As a result of my work as a former Future Academic Scholars in Teaching (FAST) Fellow at Michigan State University, I was invited to participate in the CIRTL (Center for the Integration of Research, Teaching, and Learning) Network Exchange program. This program funds students to conduct campus visits, arranged like mock interviews, at one of the 22 CIRTL institutions across the US. For my exchange, I traveled down to the University of Georgia to give presentations on both my Teaching-As-Research (TAR) project and dissertation research. Preparing for the mock-interview visit took more work than I’d anticipated. I’d thought that planning the visit during Spring Break was a good idea, however, the weeks leading up to my visit were packed full of pre-break exam grading and a conference—both of which delayed my preparations. I now know that I’m not going to be able to do everything full-speed when I go to interview for jobs, and that if I intend to still accomplish many things prior to a visit, I will need to spread my schedule out and leave about twice as much time as I’d allotted. This is necessary not just in constructing the talks, but in leaving adequate time to practice and revise them based on feedback. Traveling in right after a conference was tough, but my hosts made me feel more than welcome. I was glad that, although my visit was 3 days long, it began at 11am on the first day with lunch with my TAR host. We had a great conversation about the state of evolution education and what her experiences have been as a new professor, and she was also nice enough to share a few details about the venue where I’d be presenting my TAR research. This helped put me at ease and allowed me to focus on the moment, rather than the stress of the talks. After a few individual meetings with professors and the opportunity to observe some of the classes taught by biology education faculty, it was finally time to present. My TAR talk was modified from presentations I’d given previously at MSU, with a few additions which described my future directions and changes based on feedback from my lab members and the FAST group. The talk was centered on a model for how we currently teach the genetic basis of evolution and how we might be able to modify it for greater student gains. I was pleased to be slotted into the normal meeting time for the Biology Education group, which meant I had plenty of people to give quality feedback. Furthermore, a few guests showed up to the group that week, so I was excited to receive feedback from them directly, in addition to the feedback I later got in follow-up, one-on-one meetings and over dinner with faculty and postdocs. 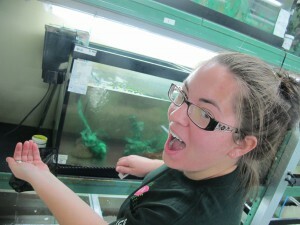 I was somewhat elated that day two involved class observations and meeting with lab groups. I was glad to relax after day one, yet still be able to observe and talk to many people from which I learned a lot. There are many kinds of reforms and research taking place in biology education at UGA, and I hope to bring back some of these to the courses I teach at MSU as early as this semester. I also had the pleasure of meeting with the graduate students and postdocs in many of the biology labs. They were very hospitable and open with me about their departments, their research, and living in the area. It was nice to be able to compare notes across labs and institutions on the graduate student and postdoc experience. Finally, I reached day three with just a few meetings and two talks to round out my visit. It was challenging to treat the entire experience like an interview, mostly because I didn’t want to believe interviewing would be this exhausting (Note: snack bars are your *best* friend to keep up!). Nonetheless, on day three, I met with a few faculty and gave two talks: one on my disciplinary research of how stickleback males change how they court with age, and one to the CIRTL leaders meeting at UGA on why these types of exchanges are valuable. I was glad once these talks were over to be able to chat, get feedback, and finally head home from UGA in the late evening. The CIRTL exchange was a wonderful experience and the preparation required and lessons learned will be invaluable for future job interviews. It was a great exercise in planning, practicing, presenting (both my work and myself) well, and pursuing an academic career. After the effort I spent to prepare my talks and familiarize myself with the work of the people with whom I was meeting, I have a glimpse at what it’s going to be like on the job market, and I’m sure I’ve learned far more than I can even reflect on now. Thanks so much to everyone who helped to organize, facilitate, and participate in my network exchange, and know I hope to make you proud when job interviews become a reality! This entry was posted in BEACON Researchers at Work and tagged BEACON Researchers at Work, careers, job interviews, professional development, teaching. Bookmark the permalink.